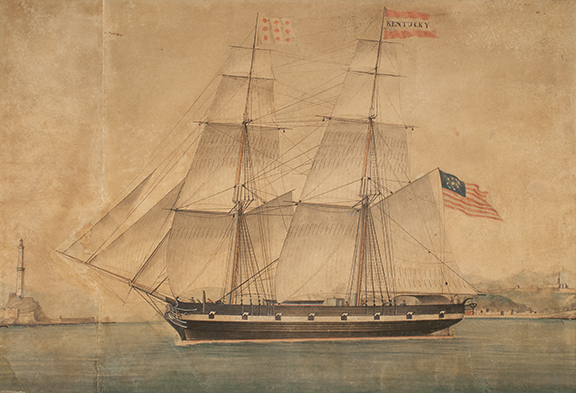 A Chinese painting of the ship S.F. Hersey, a 991 ton, 169 foot long ship- rigged vessel built in Searsport in 1865. Marlboro Packard was the master builder. She was Searsport owned until she went under Australian registery in 1888. 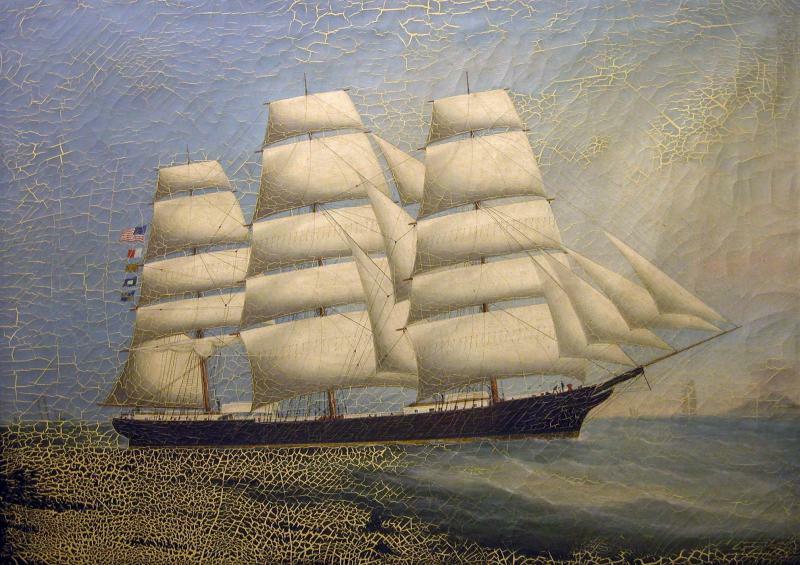 This painting's donor, Mrs. Henrietta Carver, was born on the vessel in 1885 in the straits of Mindoro, taking her middle name from the straits; her father, Captain Franklin Garey died on board the vessel in that passage. The donor's mother, Henrietta Packard, was the daughter of the vessel's builder. The S.F. 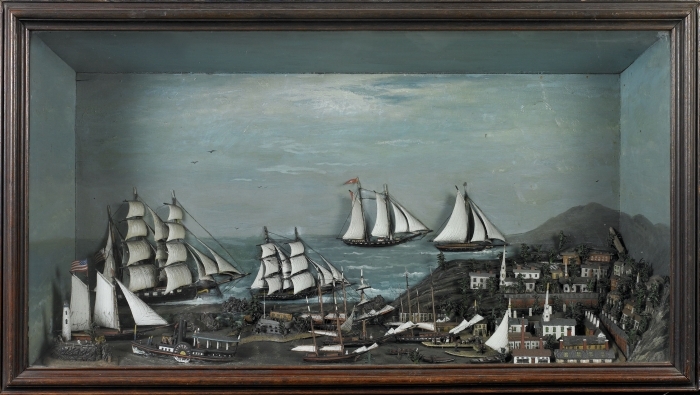 Written on the back of the painting's original backing: "The Kentucky was built in 1833 for Captain Benjamin Carver and was sailed by him for 10 to 12 years. She then went into the slave business, carrying slaves from Africa to Rio de Janeiro." 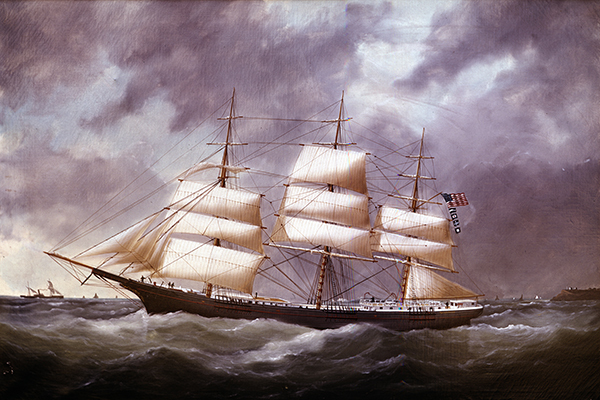 According to Searsport Sea Captains by Frederick Black, the Kentucky was one of the fastest of her type in the world. The ship Henrietta was built at Bucksville, South Carolina, in 1875. There was also a bark Henrietta, built in 1847, which Captain William McGilvery used to carry food to Ireland during the potato famine. 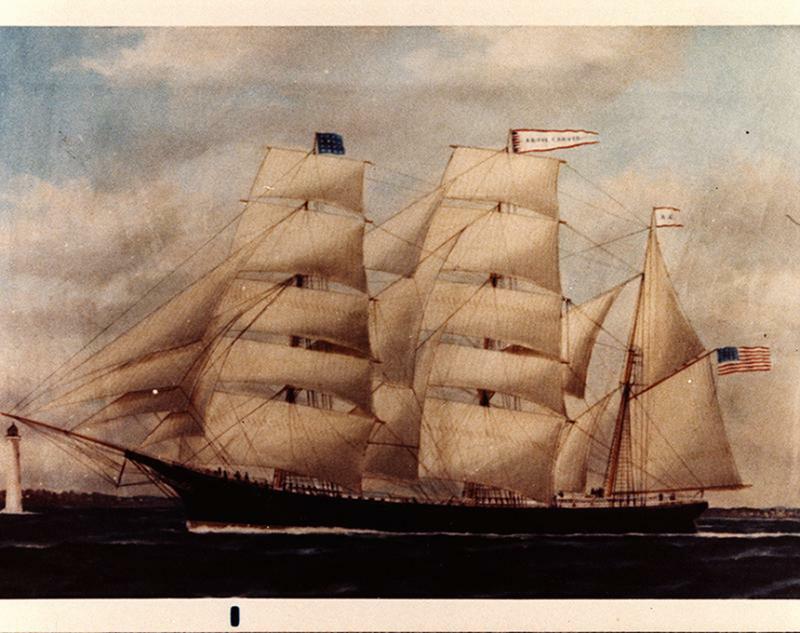 The bark Penobscot, 133 tons, was built in Bucksport, Maine, in 1878, for Captain Oscar G. Eaton of Searsport. She burned at Buenos Aires in 1915. The Maine State Seal, painted wood carving. The carving depicts a mariner and a farmer around a picture of the Maine State tree, the White Pine. 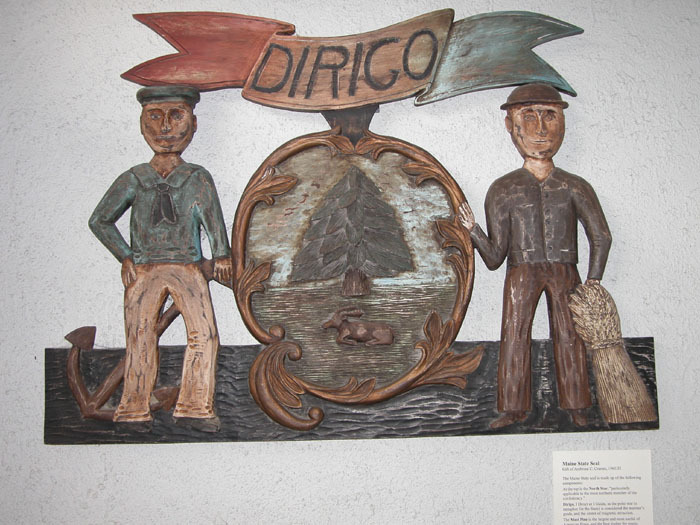 Above these is the Maine State motto, "Dirigo," which means "I lead" in Latin. Billet head carved by Thomas Seavey of Bangor, Maine. Dimensions: 24"x18"x21" including mounting board. 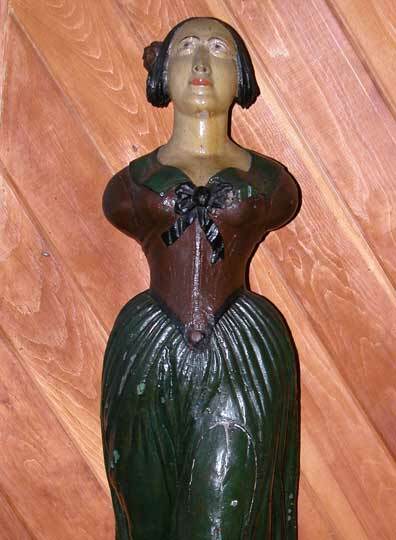 Carved but never used on a vessel, something readily seen by the sharpness of the carving and lack of paint buildup. 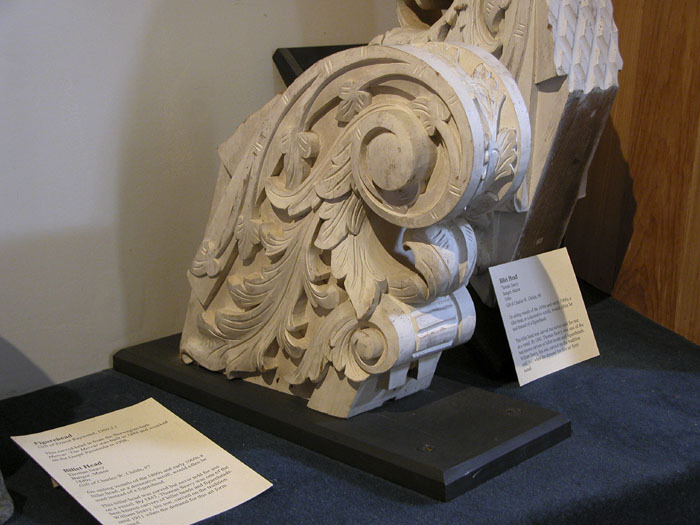 Billet heads were located under a vessel's bowsprit like figureheads, but being simpler and much less expensive would have been found on smaller vessels like coastal schooners and fishing vessels.